A new season, new inspiration! One of the advantages of the new season is the beautiful color palette that comes with it. Red and brown tones of the falling leaves, colors beautifully with golden yellow and green tones. Inspiration directly from nature! To play with a refreshing device it is nice to add accents. In this way, a different face is immediately offered in an accessible manner. For example, cushion covers with a print, unique tea light holders with real golden decorations, an atmospheric and warming tapestry or a nice hocker to relax in combination with a blanket. Brr ... Temperatures will soon be lowered, but you can snuggle away on a luxurious armchair or footstool. Autumn coats, windbreakers and winter coats can be hung on the stylish and beautiful mahogany coat rack. Creative people go to work themselves on a cold autumn day with (furniture) fabric and wallpaper. De Blauwe Deel offers many unique and extravagant (Art Deco) upholstery fabrics. 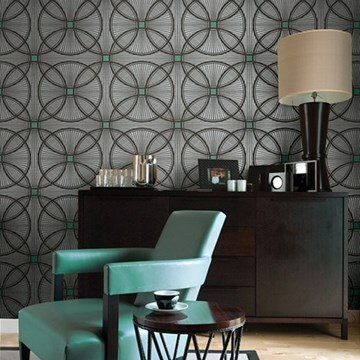 Wallpaper a niche or wall in your house with an Eastern or graphic motif and see how it pops out with the daring print. Or in the hall: a grandiose entry is realized!